NationWide Commercial Real Estate Financing Solutions! Choice To Purchase Commercial Real Estate Instead Of Renting Space! Financing Commercial Real Estate Since 2002! Helping Business Owners Secure Financing For Commercial Real Estate! Roll-Up Our Sleeves To Understand "Your Story". Financing Is Approved Based On Common Sense Underwriting Guidelines! Business owners looking to purchase their own commercial building with up to 90% financing and get pride of ownership for your business operations, we can help! BRT Financial can help with the right type of commercial mortgages NationWide! Commercial Real Estate Financing for Restaurants and Food Services, Supermarkets and Grocery Stores, Hotels and Motels, Dental Practice, Veterinary Physician Practice, Doctors and Physician Practices, Auto Body Shops, Automotive Repair Shops, Convenience Stores, Florist and Gift Stores, Beauty Salons, Dry Cleaning and Laundry Stores, Nail Salons and Day Spas, Furniture and Home Furnishings Retail and Wholesale, Clothing Stores and more! Assisted Living Financing: Commercial loans for assisted living centers were both the property and business serve as collateral for the commercial mortgage. Loans are available for owner operator centers with strong current and historical financials. Read what satisfied clients across the nation are saying about our level of service, commitment and the real success that they have achieved by working with us. "Professional company worked hard to get me the funds I needed at the right time for my business! I will highly recommend BRT to all my business friends in my area so they can reap the benefits I got from the funding. BRT is a wonderful full service financial company offering many options for all your financial needs. They helped me immensely in obtaining the working capital funding I needed for my medical practice. Thank you so much! I am pleased with service from BRT Financial, company was very helpful and I learned to discipline myself on how to operate my business correctly and having to always maintain a positive balance on my daily bank account! A professional and creative company and was instrumental in keeping our practice alive during some of the most difficult cash flow fluctuations as a start up. We are still in business today because of the help from BRT financial. 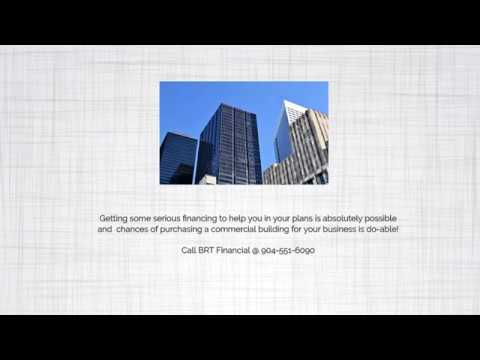 Business Commercial Real Estate Financing! Commercial real estate financing building loans are used by many sectors of the business world to finance future investments and expansion efforts to grow their business. With the collapse of the U.S. sub-prime mortgage market a number of years ago, credit is increasingly difficult for business owners to come by. Lenders are reducing their exposure to high-risk ventures and lingering uncertainty about the credit market as well as the stability of the financial markets causing widespread reluctance to finance additional business ventures. Fortunately for business owners seeking commercial real estate financing,the commercial sector is not directly affected by the developments from years ago. Although riskier commercial ventures will still be more difficult to finance with credit, the current economic climate has not stopped commercial lenders to fund the commercial building sector. While economic uncertainty would demand that all investors be prudent about entering into debt, most Organization for Economic Co-operation and Development countries are not in recession. In fact, they have actually experienced record growth and prosperity over the past decade. This lends some robustness to the major western economies. Most business expansion is financed using commercial loans, so provided debt is entered into for purposes of investment, building, and expansion of the business (rather than a fundamental cash-flow problem). Debt is not in itself a negative thing. It is the return on that debt that is the problem. Commercial real estate financing can be secured to fund the purchase of land for infrastructure and services development. Power plants, streets, utilities, shopping complexes, office or apartment buildings, parking facilities, parks, resorts, and golf courses, and even medical clinics are just a few such real estate investments. Frequently, commercial property loans are sought as a means of refinancing existing debt to increase the total value of the investment. It is possible for private investors and companies to make a career in the reiterative process of reinvestment. Financing the cost of expansion against the projected profits of the venture can be ?uite lucrative. It is true that there is still some volatility and uncertainty about the stability of the western economies. Conse?uently, investors should be as vigilant as ever about entering into unprofitable arrangements. Such factors influencing profitability include cost blowouts, too little potential return or inherently risky ventures. Investment consultants have made a market for themselves in advising smaller scale investors on commercial real estate financing, and providing them with the means of determining which projects are worth entering into, based on the available information. This includes taking into account the possible blowouts, and considering what might go wrong with any given project. Taking advantage of commercial real estate financing in the current market can be lucrative for you. By applying basic rules of thumb, and not investing beyond certain thresholds, investors can increase their chances of sticking to projects that are within their means. With the use of specialized software, this process can be further streamlined, allowing financiers to quickly weed out which projects are potentially unprofitable. Based on the available data and taking into account uncertainties and potential threats to the project, financiers can make smarter lending decisions. The key rule of business is to generate a healthy gross profit and work environment to get maximum output from your employees. Remember that it is not just about your customer who would appreciate clean, state-of-art, professional looking office space and building. Commercial Real Estates Financing for Building financing can provide the capital required for prime quality commercial space and the overall pride of building ownership. BRT has a mission to help little and average sized entrepreneurs by giving a basic and helpful alternative to customary business credit. Our business Commercial real estate financing program gives a true answer for entrepreneurs confronted with the truth of finding building loans for business real estate ownership. Copyright © 2002 - BRT Financial, Inc. All rights reserved. Want to try your hand at investing in commercial building properties, but wondering where you can turn to get commercial real estate financing for your new business venture? While finding this type of financing isn't always easy for business owners, once you know the steps to take, getting financing for your commercial building becomes a lot easier. Before you get your hopes up too high, though, you should be aware that the majority of those who plan to get make a million overnight by grabbing up commercial real estate for no money down are nothing but scams dreamed up by people trying to sell you something. Getting some serious financing to help you in your plans is absolutely possible, but your chances of becoming a commercial real estate investor for free are slim to none. In this field, the next best thing to a free lunch is owner financing. This is where the seller keeps a second mortgage so you won't have to invest any of your own money. As you might have guessed, though, getting this type of financing is extremely rare. We're talking unicorns and hen's teeth, here. Even in cases where you can get a deal like this, the seller is ultimately getting a better deal and making a profit off you. So what's the most realistic option? If you need financing for commercial real estate purchase, your best bet is to go through a commercial mortgage lender. The average commercial bank just won't take the risk of lending money to commercial real estate investors, but mortgage lenders are a little more used to high-risk loans. In particular, look for a lender that specifically mentions its willingness to work with unconventional borrowers or those with bad credit. This will help you find those lenders that are open to taking on a little risk. Don't be fooled into thinking you can easily get a loan to cover all your expenses, though. For one thing, most commercial real estate financing loans won't cover more than 80% of the property's appraised value. The rest of the money you'll have to come up with yourself as a down payment. You'll also need to put a fair amount of effort into proving that the property has enough debt repayment potential. If you don't think a commercial mortgage lender is for you, you can always look for a private mortgage lender. These individuals often called private investors offer to financing for a commercial property with a good chance of high returns despite a high risk. Unfortunately, they're not too easy to find and interest rates are a lot higher. First, talk to a commercial mortgage lender about your chances of obtaining financing and while you're there, ask if they can recommend any private mortgage lenders. Tips For Commercial Real Estate Financing! If you are considering leaping into the world of ?ommer?ial real estate financial, be prepared to make some difficult decisions and spend time conducting lengthy research. Commercial real estate can be a tough business to get started in; however, it can reap great rewards for those who are savvy (or sometimes just lucky). If you are ready to venture into this new investment world, here are some things to keep in mind. 1. Commer?ial real estate will increase your business value. Most properties require a long-term investment before you will begin to see any profit at all. Many people are fooled by residential real estate television programs where sellers renovate a home in a few months and sell it for a massive profit. Commer?ial real estate financial works in a completely different way. If you've seen past success in the residential domain, proceed with caution before plunging into commercial real estate. 2. You're in ?harge of maintenan?e and building upkeep. Even if you are renting out offices, you're the landlord. If it breaks, you have to fix it. That means you'll have to pay out ?uite a bit to ensure the building remains in good condition. There will be a few major bills if you do happen to hold onto the property for many years. 3. Choose the right type of ?ommer?ial real estate. Pick a route and stick with it, whether it is apartments, condos, offices, or parking lots. Each kind of property must be managed in a different manner. Investing in two very dissimilar properties, such as retail and apartment buildings, will only cause greater stress to you and more opportunity for failure. Choose one type and work to become an expert in that before you branch out to new venues. 4. You need to attra?t reliable tenants to keep the profit streaming in. You will have tenants that pay late, break contracts, and do many other things that might be upsetting. This is all part of the commercial real estate business. Be prepared to be hands on and involved with your clients and the building. Your investment will collapse if you do not care for it. 5. Get help. Find successful commercial real estate owners and follow their lead. Listen to their advice and most importantly, use it. They have the knowledge to help you get your new investment up and running. And why make the same mistakes that others have made time and time again before you? They can warn you about common pitfalls. Remember, if you were an expert on the subject, you wouldn't be looking for tips on the internet. 6. Enlist the services of a fin?nci?l pl?nner or ?ccount?nt. Don't bury yourself in debt or a bad investment. Be sure that this is something you can afford and are willing to take a certain economic risk in order to achieve. There is no guarantee that you will make a wise investment, but being aware of your finances can help lessen the potential (and shock) of failure. So if your cash advance business plan is to get a commercial real estate building loan or you need a small line of credit then call BRT Financial today at 904-551-6090. Best Customer Service For Commercial Building Real Estate Financing! Funding For Businesses Purchasing Commercial Real Estate! Commercial Mortgages Up To $5 Million with programs available in all cities in the U.S. - providing financial solutions to small businesses that have had problems qualifying for financing at their local bank. Help For Business Owners With FICO Credit Scores Down to 620! Terms: 15, 20, 25 Years! Up To 90% Financing! Owner-Occupied or Occupy 51% Lower Debt-Service Coverage Minimums! Real Estate Investment Financing For Your Business! If you are considering leaping into the world of commercial real estate financial, be prepared to make some difficult decisions and spend time conducting lengthy research. Commercial real estate can be a tough business to get started in; however, it can reap great rewards for those who are savvy or sometimes just lucky. If you are ready to venture into this new investment world, here are some things to keep in mind. 1. Commercial real estate will increase your business value. Most properties require a long-term investment before you will begin to see any profit at all. Many people are fooled by residential real estate television programs where sellers renovate a home in a few months and sell it for a massive profit. Commercial real estate financial works in a completely different way. If you've seen past success in the residential domain, proceed with caution before plunging into commercial real estate. 2. You're in charge of maintenance and building upkeep. Even if you are renting out offices, you're the landlord. If it breaks, you have to fix it. That means you'll have to pay out ?uite a bit to ensure the building remains in good condition. There will be a few major bills if you do happen to hold onto the property for many years. 3. Choose the right type of commercial real estate. Pick a route and stick with it, whether it is apartments, condos, offices, or parking lots. Each kind of property must be managed in a different manner. Investing in two very dissimilar properties, such as retail and apartment buildings, will only cause greater stress to you and more opportunity for failure. Choose one type and work to become an expert in that before you branch out to new venues. 4. You need to attract reliable tenants to keep the profit streaming in. You will have tenants that pay late, break contracts, and do many other things that might be upsetting. This is all part of the commercial real estate business. Be prepared to be hands on and involved with your tenants and the building investment. 5. Get help with your financing needs. Find successful commercial real estate owners and follow their lead. Listen to their advice and most importantly, use it. They have the knowledge to help you get your new investment up and running. And why make the same mistakes that others have made time and time again before you? They can warn you about common pitfalls. Remember, if you were an expert on the subject, you wouldn't be looking for tips on the internet. 6. Enlist the services of a finance broker. Don't bury yourself in debt or a bad investment. Be sure that this is something you can afford and are willing to take a certain economic risk in order to achieve. There is no guarantee that you will make a wise investment, but being aware of your finances can help lessen the potential and shock of failure. Commercial Real Estate - How To Secure A Building Loan From BRT Financial Home financing and commercial financing are two different ball games. If you want to secure a commercial real estate financing from BRT Financial, you must take into account the following points Initial Steps Before you apply for commercial real estate financing, you must lay the ground work for it. You must possess a complete business plan before you visit your lender. It’s almost impossible to secure a commercial bilding loan unless you can provide the lender with a viable business plan What You Need For Financing Your credit rating is the first thing that the BRT will look for before even thinking about giving you a loan. It's a simple rule: the higher the credit rating, the more chance of you getting a loan. If you have a high credit rating it reflects your ability to pay off the debt. He will calculate your ability to pay back the loan after taking into account your business income and expenses and global debt and cash flow. BRT Financial will calculate the cash generation capacity of your proposed building plan. If you are buying the property in order to rent it, they will calculate your future monthly mortgage payments, subtract your projected expenses and then conclude whether the remaining amount will be enough to pay your monthly biulding mortgage installments. In other words, the current value of the property will not be as important to BRT as its future worth and profit making capacity. So you must be very clear about that: the major concern of the lender is that they must get back their investment within the term of loan. If the building appraises and your business cash flows, there is a greater change of the mortage being approved. The Risk Factor The BRT will explore every possibility of underwriting your building loan and to gauge every aspect of what needs to be completed to get approved for commercial financing. The lender will evaluate all your loan information and find loopholes in your building project. Don't be discouraged about getting financing, BRT will work with you and do there best his job in secring a building loan for you. BRT Financial will not be analyzing your loan as an isolated deal, rather they will be considering the overall scenario of the building, property, market and then adjust your proposal to the prevailing market trends. If you have already submitted your building loan proposal to BRT Financial, it could score a big loan approval for you. The BRT Financial Process BRT will communicate there loan offer to you made by the lender facility through a document known as a "commitment letter". This is an official communicationletter that the loan you applied for has been approved. All the terms and conditions governing the deal will be included in the commitment letter. It is very important for you to read and understand the commitment letter word by word. It will contains certain clauses that outline the terms of your commercial building financing for your business and how to move forward. Securing a commercial real-estate financing is not at all easy but if you can see the whole financing process from BRT’s Financial perspective and prepare for it in advance, there is no reason why you won't be able to get your required building financing for your business! Find Financing For Your Building In The United States!